This two-part article discusses three distinctly different future energy visions, which generally cause fiery debates when pitted against each other. The chances that either of the two long-term visions covered in this Part 1 are realized within our lifetimes is low, but they remain very important because the most popular vision will heavily influence the direction set out by policymakers. This is presently the most popular future energy vision. Its proponents generally lobby for renewable energy subsidies and mandates, and their efforts have certainly been very successful (as shown below), aided by the obvious ideological attractiveness of this vision. What’s not to like about an endless supply of clean energy from the sun and wind? In the renewable paradise, most energy comes from solar panels and wind turbines in the form of electricity with hydro and solar thermal power playing smaller roles. Biomass is often excluded due to its environmental effects and limited availability. The main attractions of this future energy vision are no direct emissions, energy security benefits, a large technical potential and falling technology costs. On the negative side, we have the intermittent and non-dispatchable nature of wind and solar, the great spatial variation in wind and solar resource quality, and the fact that everything now has to run on electricity. In addition, as discussed in a recent article, renewable energy is not quite as limitless as proponents would like to believe. Regions like South and East Asia and Sub-Saharan Africa, which may well be home to three quarters of the world population towards the end of this century, will have serious problems achieving reasonable material standards (about 100 GJ/person/year) primarily on diffuse wind and solar power. 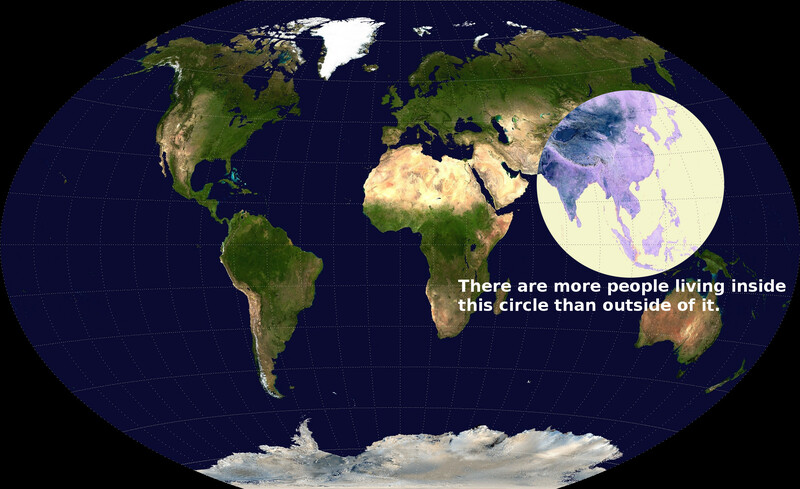 It would have helped a lot if the world population could be more evenly distributed, but, as shown below, this is unfortunately not the case. The intermittent nature of wind and solar power has been the focus of a great deal of study and debate in recent years. There are many ways to address this challenge, but all bring significant costs and complexities. In general, wind and solar power fall in value with increasing market share, resulting in an optimum beyond which increasing market share of intermittent renewables will become an ever-increasing economic burden. The biggest threat posed by this dynamic is the possibility that decarbonization via wind and solar will arrive at a point half way down the decarbonization pathway where further decarbonization becomes impossibly complex and/or expensive. As an example, the welfare optimized market share of intermittent renewables in Europe actually decreases beyond a CO2 price of around €30/ton (below) as nuclear and CCS become more cost effective than wind and solar with hydrocarbon backup. 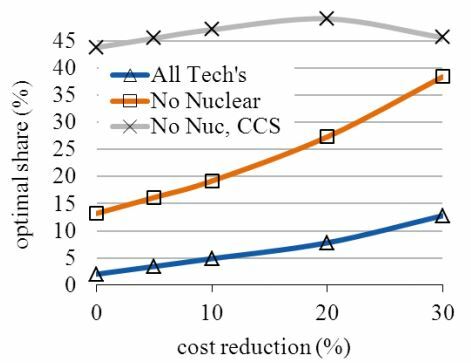 If nuclear and CCS are banned in a future carbon constrained economy, the optimal share of intermittent renewables increases greatly, but so does the average electricity price (15-35% higher) and emissions (100-200% higher). 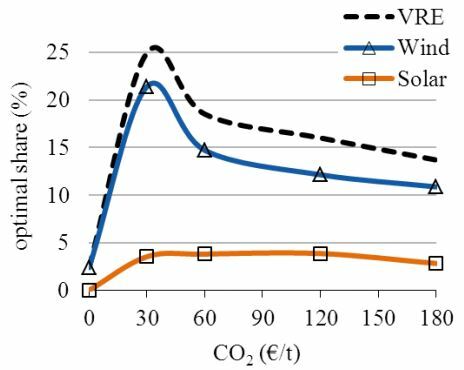 The graph below illustrates the welfare optimized market share of intermittent renewables at a CO2 price of €100/ton for different technology restrictions. Lastly, the issue of all primary energy being electricity is also an important discussion point. 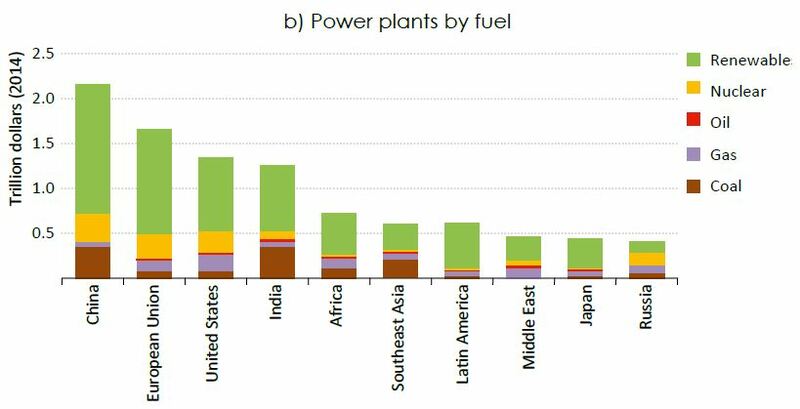 Currently, electricity accounts for only 20% of global final energy consumption. This can and should be substantially increased over coming years, but many practical and economic challenges will be encountered along the way. Most importantly, vital sectors such as high-temperature industry, long-distance transport and heavy freight simply cannot be electrified. This is a major problem because these industries are central in the massive infrastructure buildouts required to grant roughly 6 billion (and counting) developing world citizens a reasonable standard of living. As shown below, this vision has been in terminal decline for a long time, but may be recovering due to a new interest from the developing world. 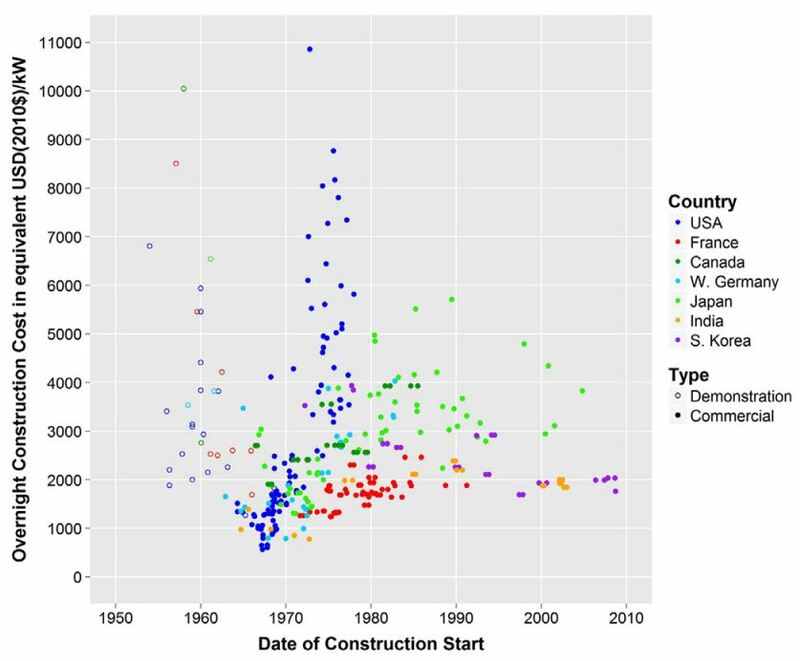 Since nuclear reactors generally have quite long build times, we have to look at the numbers for reactors under construction and in the planning phase to get a glimpse into the future. These numbers are shown below. 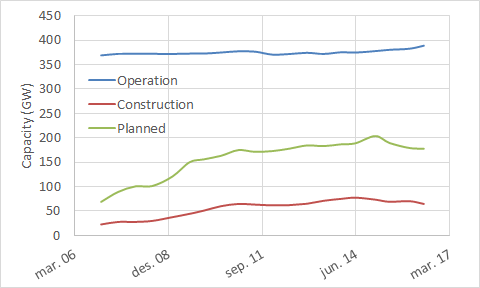 Even though the number of reactors in operation stayed roughly constant over the last decade, the number of units in the construction and planning stages have increased strongly. The Fukushima incident halted this rapid growth in reactor starts though. Currently, reactors equivalent to 17% of the current operating nuclear capacity are under construction, suggesting that the recent uptick in operating reactors will probably be sustained. Gradual completion of these reactors over the next 5 years will allow nuclear to gain about 0.35% of the global electricity market per year. For perspective, wind and solar (combined) have shown an almost perfectly linear gain of 0.55%/year in the global electricity market over the past 5 years. In the hope of accelerating nuclear’s revival, proponents generally lobby for reduced policy uncertainty and increased public acceptance. This focus is well justified as history has repeatedly demonstrated that political factors can easily double or triple the cost of nuclear power. The historical cost of nuclear reactors from several countries is shown below. It is clear that reactor costs vary over a massive range, but that modern reactors can be built for a competitive cost of $2000/kW. As the data above suggests, the politics surrounding nuclear are very complex and volatile. Proponents highlight the clean and concentrated nature of nuclear energy. Detractors point to nuclear proliferation risk, nuclear waste and nuclear accidents. Science agrees, however, that nuclear is one of the safest available energy technologies in terms of deaths per unit electricity delivered. Questions have also been raised about nuclear scalability. Global proven uranium reserves below $260/kg amount to about 4.6 million tons, which is enough for about 166000 TWh of electricity – only 7 years of the current total global electricity consumption rate. However, uranium at $260/kg contributes only $7.2/MWh to the cost of electricity. Nuclear will therefore remain competitive at higher uranium prices. Particularly, prices above $1000/kg could make uranium extraction from the ocean viable, unlocking 100-1000 times the current reserves. Uranium at this price level would contribute about $28/kWh to the cost of electricity, which is still viable. Even though the technical potential of nuclear energy is sufficient at uranium prices above $1000/kg, the political headwinds will only become stronger as nuclear energy grows. Given that a true nuclear powered world will require a 100 times increase from current levels, this may well be a showstopper. However, there are technologies on the medium-term horizon that could change this outlook. 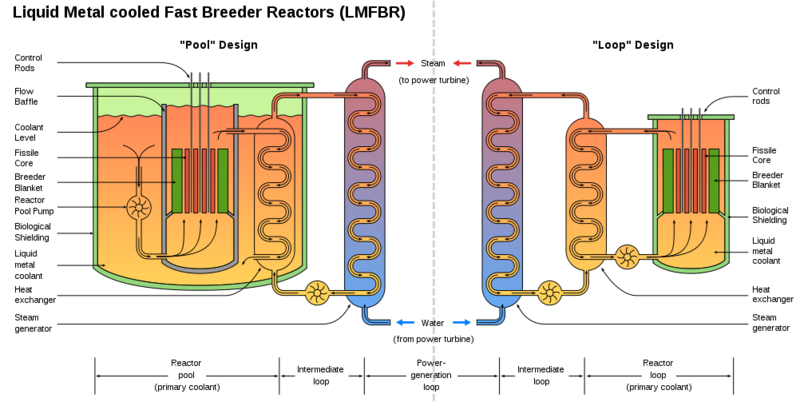 Several generation IV reactor designs could address nuclear’s most important drawbacks (above). Very large improvements in the areas of waste and safety appear to be on the cards. Another advantage is that the high process temperatures of Gen IV reactors are sufficient for several important industrial processes – an important edge over wind and solar. However, the prolifiration issue seems to be more mixed because such reactors could be modified to produce weapons-grade nuclear material. Gen IV breeder reactors (below) appear especially promising. These reactors use about 100 times less fuel than today’s reactors, making the technical potential of this technology truly limitless. Limitless energy certainly is an enticing prospect. It can allow us to directly address pressing environmental issues like clean water (through desalination) and climate change (through direct air capture of CO2). Perhaps more importantly, it opens the possibility to truly eliminate all forms of material lack and propel the human race to the next level of societal evolution. These seemingly sci-fi visions are dependent on economically viable and safe deployment of breeder reactors. Reliable cost estimates of this technology are hard to come by though. A recent joint IEA and NEA publication on levelized costs of electricity gives a fairly broad range of $75-175/MWh by 2030 at which time they estimate that 6 GW of these reactors should be operational. When looking out to the 22nd century, the limitless nuclear vision appears to be more likely than the renewable paradise. Generation IV nuclear reactors do work in principle, and the related promise of truly infinite clean energy which can be deployed and dispatched anywhere on demand is highly attractive. 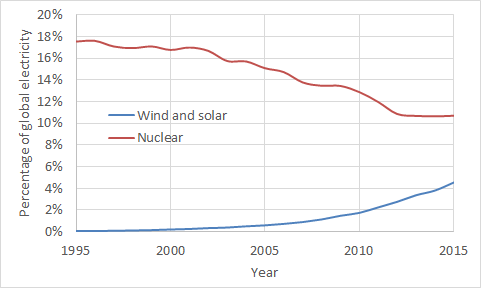 If Gen IV nuclear fails to deliver the goods, however, society may have to adopt a much lower energy lifestyle with a great deal of expensive and disruptive migration towards regions of high renewable energy potential. We will need to see some rather impressive cultural shifts for this to happen peacefully. Shortening our time horizon to the middle of this century, I agree with almost all official energy projections that new wind and solar will see much more investment than new nuclear (below). Today’s commercial reactors do not fundamentally address the major political headwinds, so it is difficult to see nuclear truly taking off before Gen IV reactors take over. Given nuclear’s history, I would be very (pleasantly) surprised if the 6 GW of breeder reactors mentioned earlier are actually operational by 2030. Projected costs are also not competitive without substantial subsidies, implying that growth will be slow. So, after all of these words, the most likely scenario appears to be a push towards the renewable paradise until the second half of this century, by which time there will be a gradual switch to the limitless nuclear vision. Part 2 of this article will present a third “hydrocarbon bridge” vision by which we can arrive at this transition point in the best possible shape.